On an ordinary Wednesday afternoon, a moment of history was made at the University of Cape Town. Workers and the university management signed a landmark agreement to end outsourcing on campus. But the battle for insourcing has been waged for many years, so why has UCT management only now changed its mind? RAâ€™EESA PATHER offers her considered opinion. As a student, I sometimes saw workers protesting beneath the ivory pillars of Jameson Hall. In their red t-shirts and black slacks, theyâ€™d march down the iconic steps towards the rugby fields, demanding a fair, living wage. Even in protest, they occupied a small corner of the plaza, huddled together largely unnoticed, their voices muted by students gossiping on the steps. That was at least three years ago, and transformation is now rapidly manifesting at one of Africaâ€™s most privileged institutions. 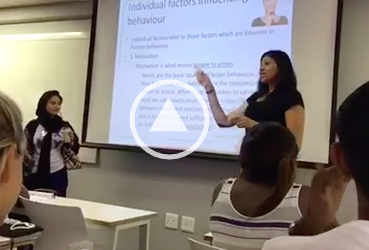 The student uprising at UCT has led to remarkable changes on campus in less than a year. The statue of Cecil John Rhodes was removed, the university confirmed that there would be zero increase on academic and residence fees for students from across the African continent, and, this week, UCT management and NEHAWU UCT finally came to agreement on insourcing. The insourcing victory is however very different. In every student struggle this year, students have boldly taken on issues that affect themselves and their peers. The UCT Fees Must Fall movementâ€™s persistence to continue the campus shutdown to end outsourcing was beautifully unselfish in a time when students were pressured to resume the academic programe or face staying back an extra year. But an ugly truth canâ€™t go unnoticed. â€œItâ€™s been years that UCT has said the same thing. Every year they say they will look into insourcing, but Iâ€™ve been here for 10 years as an outsourced worker,â€ Xolisa Kula, an outsourced security guard from G4S, told The Daily Vox. Just last year, the UCT Council initiated a review on outsourcing. 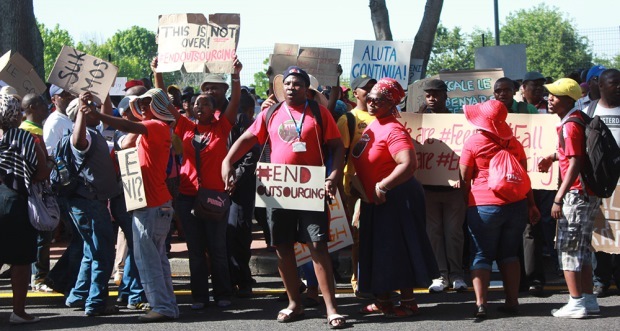 The findings of that report â€“the Report on Outsourcing at UCT (14 April 2014) â€“ recommended that the university increase the minimum wage. Council refused the recommendation, because it â€œwas not affordableâ€. Earlier this month, before the student movement took off, the university once again released a statement, saying insourcing was unaffordable â€œwithout raising student tuition fees significantlyâ€. Â But here we are, two weeks later, and miraculously, UCT has agreed to insourcing. What changed in the past two weeks was that middle class students â€“ with their social capital to draw headlines, and their influence as students to shutdown the university â€“blockaded the campus, and even took the protest to Parliament. Students donâ€™t have to fear losing their jobs, or not getting paid, and they havenâ€™t been systematically marginalised in the same way as poverty stricken workers. We know too well that the poor are often ignored, and their financial reliance on those who have authority over them leaves them under constant threat that any march for change might leave them with no livelihood. Already, workers have been arrested for joining the students. I spoke to Kula outside the Wynberg Magistrates Court, where he had joined a large group of UCT workers and students standing in solidarity with fellow protestors arrested last week Tuesday. The majority of workers outside that court hadnâ€™t heard the news that UCT had agreed to commit to insourcing, even though they should have been the first to know. Still, when I tried to speak to workers, they balked, fearful that they would lose their jobs despite the fact that NEHAWU and the students had secured a protected strike. 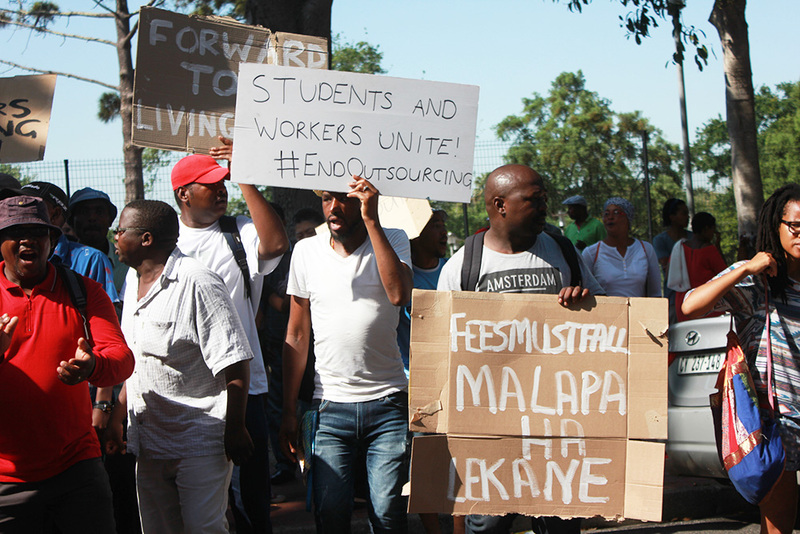 UCT and the outsourcing companies have a hand in the poverty in which these workers live. 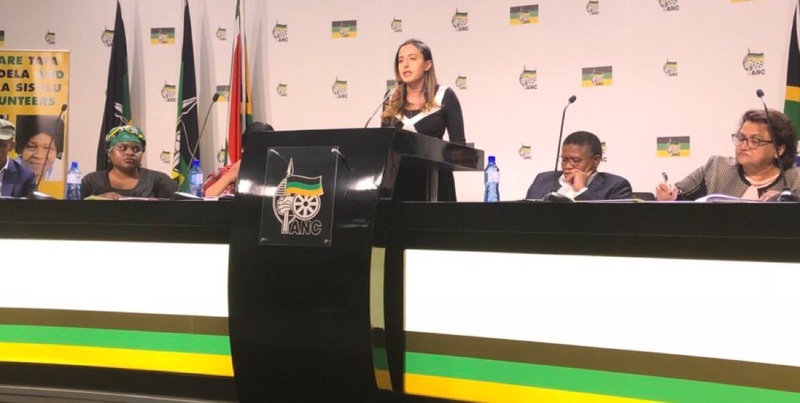 The university bases its outsourcing minimum wage on the archaic Supplemented Living Level (SLL), which was established by the apartheid regime to calculate how many rands a household requires to afford a â€œmodest low level standard of livingâ€. Yes, in democratic SA, markers that calculate â€œlow levelâ€ living standards are treated as legitimate. As Budlender and Lorenzen write, the SLL grossly determines living conditions such as how long adult men can re-use their underwear. While UCT employed this system, workers like Kula were working ten years to earn what could have been made in a few months. â€œIâ€™ve been working for 10 years, but when I went to check how much I have in my provident fund, I found out I only have R55,000. Thatâ€™s one month salary for other people, but for me itâ€™s for 10 years,â€ Kula said. Outsourcing was introduced to UCT in 1990 and became a fixed system at the university in 1999. Workers have continually addressed the university about their wages, but their voices werenâ€™t enough. They lost years of their lives, and of their futures, because middle class students are the only voices that get noticed on campus. Now, with insourcing finally secured, workers have at least one dream they hope to make a reality. Enjoying our coverage of the #FeesMustFall protests? Please help us to keep doing what we do by donating to our crowdfunding campaign here. Editor’s note: The headline of this column was changed on the morning of Friday 30 October. Great piece … as always! Thanks for your coverage and reflection. As you note, this struggle has gone on for a long time. Ronald’s report and reflection are worth reading, especially in the light of both what’s happened and what’s about to happen.